I understand that the multiplatform series are not geared towards me but I was pleasantly surprised. A book combined with an online game isn’t really created with me in mind because I don’t need an incentive to read. 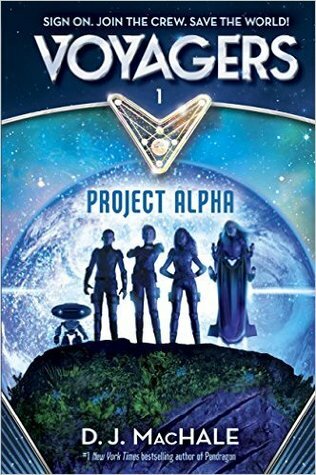 However, I think that kids who struggle with reading or wanting to read but love video games and sci-fi and action-adventure will really get a kick out of Project Alpha the first book in the Voyagers series. Eight twelve-year-old kids have been selected from thousands of applicants to compete for a place on a space ship. This is not your ordinary space ship, it will be sent off into space in order to save Earth. Earth’s natural resources are running out. With no way to power the world’s electricity, Earth needs to look to the stars for a solution. But only kids can survive the hyper speed space travel that is required to find a new source of power. So the best and the brightest are being selected. Oh and it does not hurt that you also win ten million dollars if this all succeeds. IF. The first part of the book is a competition between the eight kids where they fight for the four spots on the space ship to go on the mission to save earth. This book lacks details but quickly moves from one point to the next. And what it lacks in details it makes up for in the action-adventure. There is just enough mystery thrown in that I am actually interested in seeing where this is all going. Personally, for me, my favorite part is the character Piper. She is in a wheelchair but she is portrayed as a can do anything girl. I love that. I feel we need more Pipers in the world. Project Alpha comes out today, September 1, 2015. And bonus, because this is a series geared towards non-readers, you won’t have to wait long for all the books to come out. All 6 books will be published within the next 12 months. This entry was posted in Middle Grade, Science Fiction and tagged D. J. MacHale, Middle school, multiplatform, non-readers, Project Alpha, Voyagers 1. Bookmark the permalink.